8 built-in synth engines, multiple effects, LFOs, and unique sequencers ready to explore. Connect it to your computer and control your DAW. Use the 4 rotary encoders and 8 x 2 dedicated quick keys for fast selections. The color coded interface/graphics on the beautiful OLED display are directly related to the four color rotary encoders and the legend on the keyboard. A non-technical way to control + shape your sounds: you don’t have to be a scientist to use this synthesizer. 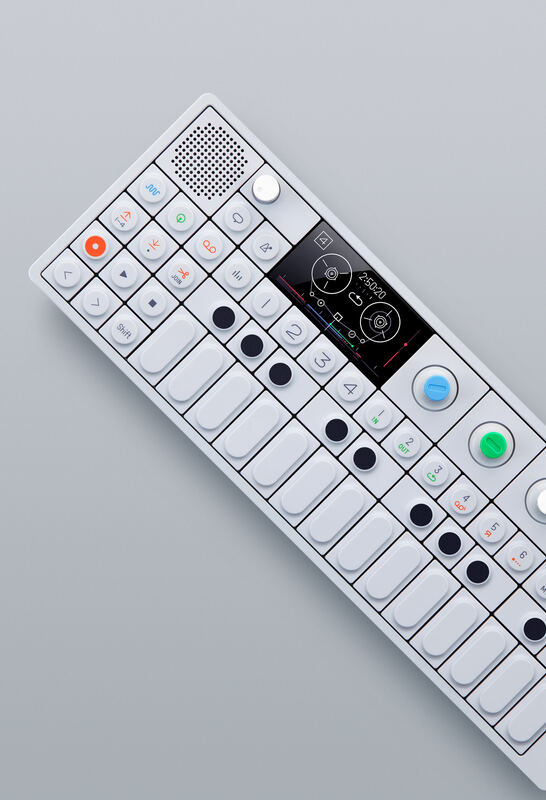 OP-1 is the all-in-one portable synthesizer, sampler and controller. Play at max volume for 16 hours constantly making music on your OP-1 before it runs out of power. And at the same time have over 2 years of stand by time. "Wholly inspiring creative tool. Sampling with a mic or off the FM tuner is easy and leads instantly to ideas I normally wouldn't come up with. The built-in battery lasts days, letting me carry it around everywhere for music making on the go. The way the 4 main knobs get mapped to various groups of parameters for editing synths and effects is awesome and inspiring. Recording to the simulated tape reels is probably the least intuitive part of the device, but I enjoy the challenge and fresh take creatively. The included case is really well made and seems like it'll protect my OP-1 for years." "Great creative synth! Having a lot of fun!" Download the official OP1 manual here.